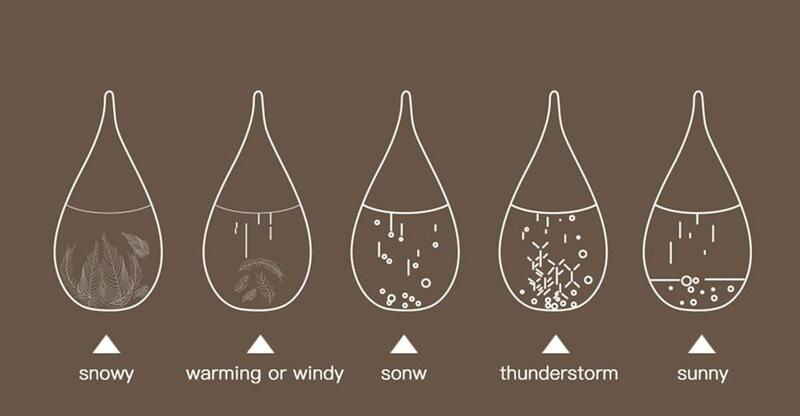 The cool new and modern Storm Glass is a natural way to forecast the weather. The sealed glass container holds a mixture of distilled water, and camphor that changes in appearance based on forthcoming weather conditions. Drop type glass containing liquid is, very strange objects to repeat the crystallization of various expressions, depending on the weather changes. Use it to decorate the living room, bedroom and table is very beautiful and fashion，Makes a great executive gift. In the 18th and 19th centuries invented it is generally considered to be England captain G.Robert FitzRoy, Darwin was historic voyage is his ship. Bottle in his records, storm is in a sealed glass bottles into distilled water, alcohol, potassium nitrate, ammonium chloride and camphor mixture, such as bottles can be different shapes of crystallization and precipitation forecast including sunny, cloudy, foggy weather, storms, snow, wind and other weather. Of course, he doesn’t seem to predict ahead of time.The principle of “descendants of” Storm glass to do some research.Ph. D Anne Marie Helmenstine think storm bottle based on the influence of atmospheric temperature and pressure on the solubility of work, but she was not totally sure what ingredients cause of the change.There are other scientists retort that the bottle is sealed, unable to effectively perceive air pressure and temperature, and then doubt the effectiveness of storm bottle of weather forecasting.View, put forward by the new storm bottles of the surface of the outer wall and internal mixture interaction that allows the formation of crystals. Some view the current role of glass material itself and quantum tunneling through as to a certain extent will affect the storm bottles of rendering result. Less the number of papers on the above experiments, some argue that the forecast basically, caused by storm bottle temperature is the only factor that affect the growth of storm crystal bottle.